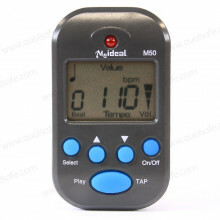 Purchase 50 or more Mini Metronome s and download your free support pack worth £100. Purchase 200 or more Mini Metronome s and you can have personalised covers absolutely free! When did you last check that you did chest compressions at exactly 100 per minute? Studies have shown that some First aid trainers and healthcare professionals go way too fast! This easy to use mini metronome omits a regular audible beep to allow both trainers and students to effectively measure their CPR speed.